I can't believe it's been 5 months since I posted anything. I'm SO sorry! My mom had open heart surgery in June, she started chemo in August as well as the kids starting school and the Fall got away from me. I have also been working on my daughter's 12th birthday party. She loves the movie "Legends of the Guardians" so it was only natural that we have an owl party. I made owl necklaces for all of the guests as well as custom owl pillows out of some great designer fabrics such as Heather Bailey. 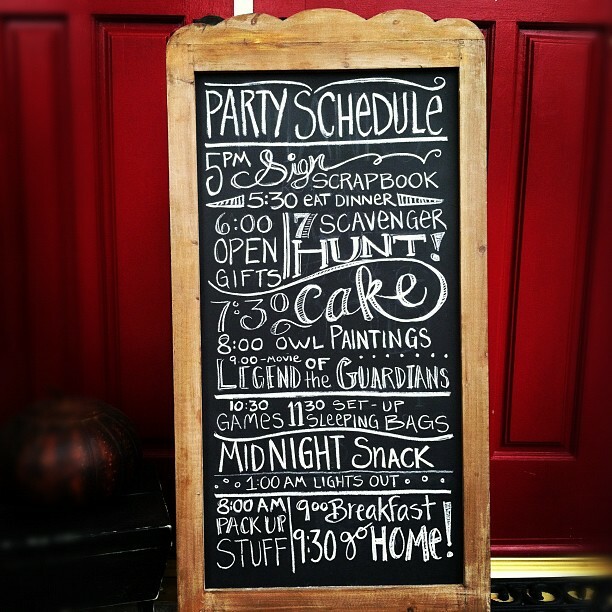 The printables for the party are from Frosting & Ink and were the inspiration for all of the decor. Ready to watch the movie "Legend of the Guardians". Fabric for the food table curtains is from IKEA as well as the owl picture. I added wooden crates and wood rounds for a natural element. Owl cookies for the Midnight Snack are from TS Cookies and they were amazing! The centerpieces for the activity table had fresh flowers in mason jars with fabric wraps. I also incorporated homemade yarn pom poms and crocheted flowers for an Anthropologie feel. The lace candle holder is from IKEA and I also used the matching tray for the cake. I also swagged doilies and pom poms on burlap poles around the table. Even the front door had an owl welcome! I made the Devil's Food cake and homemade frosting (recipe from Dear Lillie blog) and used a feather technique with the frosting. I also made the pom pom banner. One of the activities was to paint owls on canvas. The girls really loved this and it was fun to watch their creativity. Owl backpacks had toothbrushes, toothpaste, tissues, lip balm and sleeping eye masks. I got the owl aprons from Oriental Trading Co. Transferring M&Ms from one plate to another using straws. worn on the head at plastic bottles. your mouth by wiggling your face. Even the bathroom had a touch of owl decor! Since the girls went to sleep at 4:30 am, it was tough to wake them up for breakfast even with the smell of bacon cooking! note from my daughter. Everyone had a wonderful time! One lucky young lady to have you as a mom! Everything is so bright and these owls are so sweet! How did you make or where did you get the owl backpacks? I hope your mom is doing well. I know how time consuming it is caring for our family , esp when they are ill.. (my mom is 87 & lived w/us for a while. One year it was the backwards party. I sent thank Yous as invites .. they wore their pjs to the party & got dressed before 'bed' LOL who sleeps ? presents were opened in the morning & dessert was served as breakfast..
another year the 12 girls attended a Red Hat party.. they decorated them with glitter & feathers & then had their 'fashion' pics taken by dad.. so cute. Grandma & mom even got in on that one. another year , was a charity party.. fleece lap blankets were made for those in the nursing home & instead of gifts ( Although they didn't adhear to that bit :-) food was taken to a local food bank. anyway.. love your OWL party & pray your mom is healing now. You do slumber parties too. It's pretty amazing. The slumber party idea is a huge one. I Love it.